Napoleon arrived on St Helena on 16 October 1815 after the defeat that summer by the British and Prussians at Waterloo. The likelihood of his escaping was as remote as the island itself. The fortifications were truly formidable: gun emplacements bristled from every strategic point overlooking the ocean, and the lessons of the Dutch invasion had been learnt, so that inland passes were covered from the heights. One first-time visitor reported: 'Batteries now appear In every direction; guns, gates, embrasures, and soldiers continually meet the eye.' St Helena was in effect an impregnable ship of the line permanently at anchor in the South Atlantic. On a visit to the house of one of his aides, Marechal Bertrand, near St Matthew's vicarage, close by Mount Pleasant, Betsy Balcombe, accompanied by Napoleon, drank 'delectable coffee' prepared by La Pages, but gives no hint as to its origins. Mount Pleasant is in the Sandy Bay area of the island and within five hundred yards of Bamboo Hedge, which is where the original coffee from Yemen was planted in the 1730s and which is one of Solomon’s growing areas (and is now the central farm for St Helenian coffee cultivation). It is tempting to suppose that Sir William would have told Napoleon about this old coffee plantation, which is in sight of his house; and that, he might even have prepared the coffee from Bamboo Hedge for the Emperor. Although St Helena was still in the possession of the East India Company, during Napoleon's exile its government was taken over by the Crown, which also paid for the vastly increased expenditure necessary to keep the island in a constant state of high alert. Curiously, despite the frequent mentions of Napoleon's coffee-drinking on St Helena, there are no references to coffee amongst the detailed accounts of deliveries of food and wine to Longwood with the exception of an incident when Hudson Lowe made a gift of coffee to the Emperor, which played a part in their falling out at their second meeting in April 1816. By then a considerable agenda had built up. It is not certain where the coffee came from and although it is tempting to assume it was from the plants that had lately been seen at Sandy Bay, Montholon asserts that Lowe had received it from Reunion, the small French island in the Indian Ocean. On the face of it, that would seem unlikely as East Indiamen rarely called there, and French ships would not have been welcome on St Helena. However, Reunion coffee was at that time being sold in significant quantities at the Cape, and there was a flourishing private trade between the island and Cape Town. It is thus perfectly possible that on this occasion coffee from Reunion did find its way to St Helena and on, via Lowe, to Longwood. 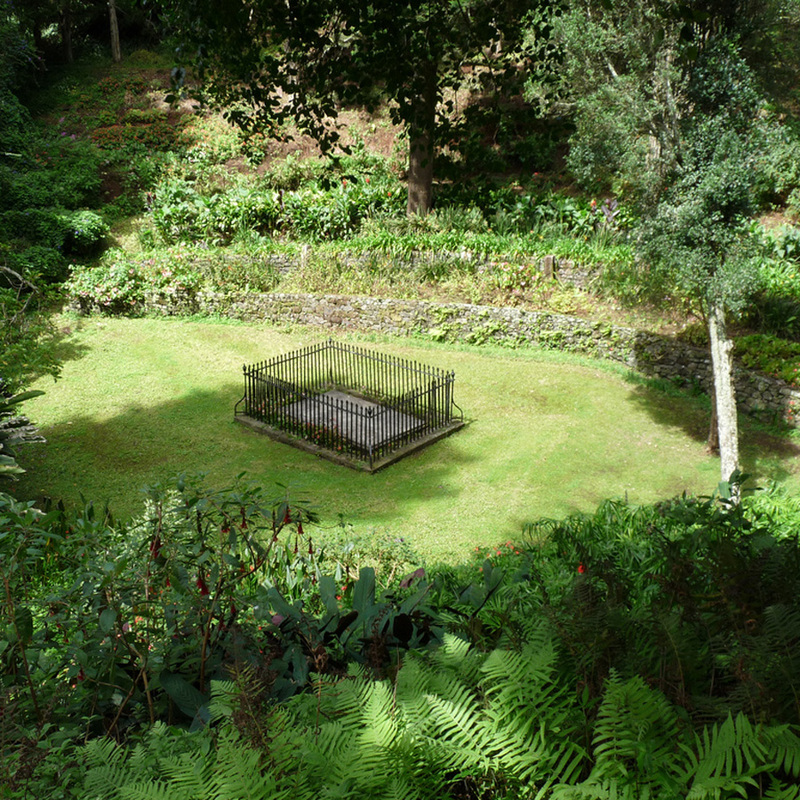 Napoleon briefly took up gardening, built a Chinese Tea House, and planted coffee bushes as the centrepiece of what became known as Marchand's Garden, outside the Emperor's bedroom. The coffee bushes wilted in the winds, and died along with Napoleon's enthusiasm and, soon after, the man himself. The cause of death is still much disputed, although stomach cancer remains the official explanation. While arsenic has indeed been found in samples of Napoleon's hair from St Helena, it also exists for unexplained reasons in samples from as early as 1805, as well as in the hair of his three sisters, which rather undermines any suspicion that Napoleon was poisoned on the island. "That morning, he had asked twenty times if he could be allowed some coffee. 'No, Sire', 'Might the doctors allow me just a spoonful?' 'No, Sire, not at the moment, your stomach is too irritated, you would vomit a little earlier, perhaps.' He had already vomited perhaps nine times during the day. What a great change had overtaken him! Tears came to my eyes, seeing this formidable man, who had commanded with such authority, in a manner so absolute, beg for a spoonful of coffee, seek permission, obedient as a child, asking again and again for permission and not obtaining it, without ever losing his temper. At other times during his illness, he would have thrown his doctors out, flouted their advice and done as he wanted. Now he was as docile as a child. So, here is the great Napoleon: pitiful, humble." Napoleon died at 5:49 in the evening On 5 May 1821 in his camp bed, which had been moved to the drawing-room at Longwood. On his death, the Emperor had directed that 'I desire that my ashes should rest on the banks of the Seine, amid the French people whom I have so loved.' However, the British considered his body to be a threat to national security: Lord Rosebery remarked that 'The arrival of a dead Napoleon in Europe would be second only in embarrassment to the arrival of the living.' So he was condemned to a further exile post mortem. A burial site was selected for him situated in a pretty valley close to Hutt's Gate, by a spring from which he had always insisted that his personal drinking water at Longwood be drawn: coincidentally, it was called the Sane Valley. The funeral took place with all due pomp and ceremony, the route' lined with every member of the 3000 man garrison. The hills resounded to the boom of cannon from ship and shore, and a band played solemn martial music. After the burial, the young willow trees surrounding the grave were stripped of leaves and twigs by souvenir hunters.